Designs By Amilyn: Newest Kit NOW ON SALE! 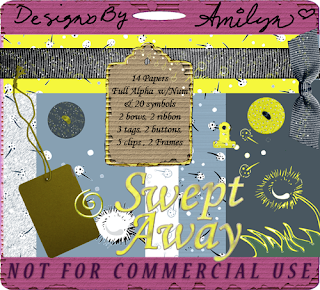 I newest kit Swept Away has been posted and is now for sale at Lezhina-Designs.com or just click the name of the kit to be taken directly to it. This kit was inspired my my children and their love for "Blowing Flowers" better known as Dandelions...or weeds....lol! It has 14 beautiful papers and a ton of elements to go along with it! Not all papers are shown becuase I wanted to show more detail in a few of my favorites. So go on over there and check it out! Who knows you might find another kit of mine or other designers that you really like!